It's a chilly Tuesday here at my end of the world and I love waking up to the pitter-patter of the rain on my bedroom window. Yesterday, I was a little stressed out about certain blog issues I was experiencing but after a good restful sleep, I woke up feeling much better. I'm having my coffee now and it feels good to be at home instead of working outside in an office somewhere. I thank my lucky stars that working from home suits my laid-back lifestyle very much. I feel a little sorry for everyone who's stuck inside the office right now when they can be happily at home like me; wrapped in a fuzzy warm blanket, sipping coffee and checking emails before officially starting my day! With a little free time on my hands today, I plan to finally unpack my suitcase and luggage from my trip last month. When we first got back, I was exhausted and I left my suitcase unpacked on the chest at the foot of my bed. It has been sitting there since and I've been unpacking it little by little. But there's still a lot of unpacked stuff inside and I should really put away the suitcase. Currently, my kids have turned it into their own sleeping bag! The kids love sleeping on my trusty navy blue travel case, which I've been using for more than three years by the way. There is a tear right down the front of the bag, which we suspect happened on our last vacation. It's not that bad of a tear but big enough to warrant a new luggage. Meanwhile, Phoebe has officially made it her new hang out. She loves lounging on my travel case and refuses to budge whenever she's comfortably stretched out! 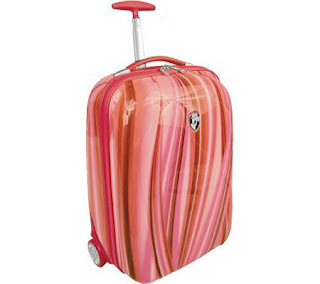 I kinda like this sleek Red Flow XCase Exotic travel luggage; what do you think? marzie, quick come chop at AGP! woohooo...really wanted to dance..but my body still sakit ma...cant even walk properly.. I see you too jean. Yayyyy! Long time! :) I've been hitting straight FCs here for quite sometime now. lolz. oh silly me indeed. I get what you mean. You dont use a badge here. lolzzz. Must be the upcoming solar eclipse tomoro... haha! Yay, thanks pinky buddy! Hope MPG will get more PBs in August woo hoo! :) Dropping for MPG now…. Thanks sweetie, that would be great and MPG will be on posting frenzy too he he! Hi mariuca!! my friend connect has been acting up...see no image and no details. the luggage looks good and it suits you best. Oh my I think that I have a brand new appreciate for just exactly how hard you work! I am glad that I will be working from home also but wow getting things in order and started up takes a great deal of time. Sorry to hear you had some blog problems. But was very excited to see you pop in! Gee whiz, I still have to find time to visit Emila, Jean, LJ, Monica...oh my the list goes on and on. Thanks for placing an ad...that was so sweet! say hello to everyone for me and tell them I will be by as soon as possible. We are have bad some pretty bad weather hanging around so I am limited today...storms through tomorrow. Wow Marzie how do you do it? I am just working on getting things lined up and I am exhausted! You, Jean, Emila, LJ, and a ton more are really incredible!! My internet connection failed me last night GP!! I came back after running errands.. then unpack some more boxes, switched on Miss Fly and found there was no connection. I'm suspecting it's coz of the rain lah!! Unless I have to go out, then I prefer it does not rain! Huh? Now only you unpack your suitcase? I normally unpack it right after I return, cos cannot stand having the suitcase still unpacked. That's me! haha! How’s your connection today LJ? Hey Jackie, I MISSED YOU! Yeah sweetie, neverending blog issues but I guess that’s just something that we bloggers have to endure once in a while. Doesn’t mean I like it but I gotta tough it out, hope it all gets fixed for good soon though. Ha ha will try to keep da stress at bay Metz, thanks for dropping by! I love the colour of the luggage Monica! Same here TH! So breezy! LOL @ Sandman wanting to create another badge for WOAFS, ROTFLMAO! Hugsy Sandman! Indeed, pink and red memang best Marvic! You did it woman, thanks for chopping! Oh no poor Marvic, dah okay ke tu? Tak take MC? First chop here Jean, but at MD and MPG got few chops edi! Yay Jean, keep on chopping!